After playing 150 dates across the globe, to over 3.7 million people, grossing a none-too-shabby $386 million in the process, The Police have completed their reunion/farewell tour. The final gig took place at Madison Square Garden in New York City last night. At the conclusion they made the catastrophic decision to have Porky Pig do his stumbling 'That's all folks' routine. The gig didn't start off too well either. Instead of regular opener, Message In A Bottle, the band embarked on a poor cover of Cream's Sunshine Of Your Love. Nevertheless, things picked up when Message In A Bottle was played with an accompaniment from the New York City Police Marching Band. Oh, the associations. The band progressed through their classics in next to no time, playing for just under two hours. Notable renditions of popular songs - such as Walking On The Moon, Invisible Sun and Can't Stand Losing You - certainly got the crowds going. In the end, though, our hats go off to The Police for packing out the huge venue some 24 years after their initial demise. 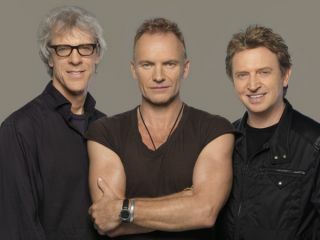 Sting had previously insisted that the band would never reform, but he certainly looked happy to be playing with Copeland and Summers for one last time.